Most extant, small images of Shiva as Nataraja that are commercially available are either new or twentieth century, no matter how they are described. 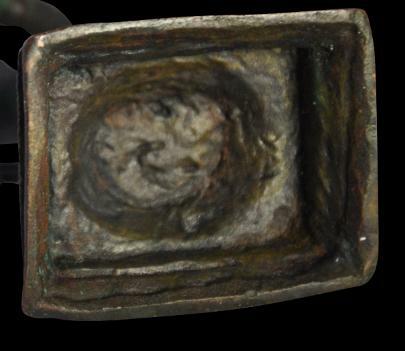 This image with a varying green and brown patina dates to around the fifteenth century. Shiva has a dynamic pose, is finely rendered, and thrusts out of the surrounding aureole in a robust, dimensional manner. abhayamudra. His principal left hand points towards his raised foot. In his free hands, he holds a flaming oil lamp and a small ritual drum (damaru). A snake is coiled around a third hand. A flaming aureole surrounds Shiva, halo-like. Probably a ribbon flowed from Shiva’s waist to the aureole but this is long gone – perhaps it was removed at the time of casting. Similarly, tresses often fly out from Shiva’s head to the aureole in other examples and these are not present. The effect of this is to keep the image sheer and simple, reducing the visual complexity of the piece. The tall chignon atop Shiva’s head is typical of pieces from this period. The group rises from an oval platform cast with lotus petal sides. In turn, this sits on a rectangular plinth incised with various geometric and other designs. Shiva is cast finely with numerous bracelets, anklets and other jewellery. His face is clear and crisp and the features are styled according to the period. 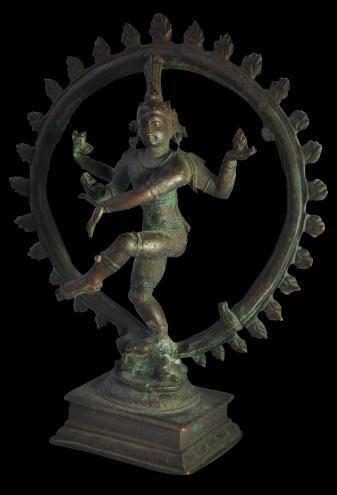 tandava, the dance in which the universe was created. The small drum symbolises the creation and perpetuation of the universe. The flame in Shiva’s hand represents the final dissolution of form, from which a new universe will be formed. 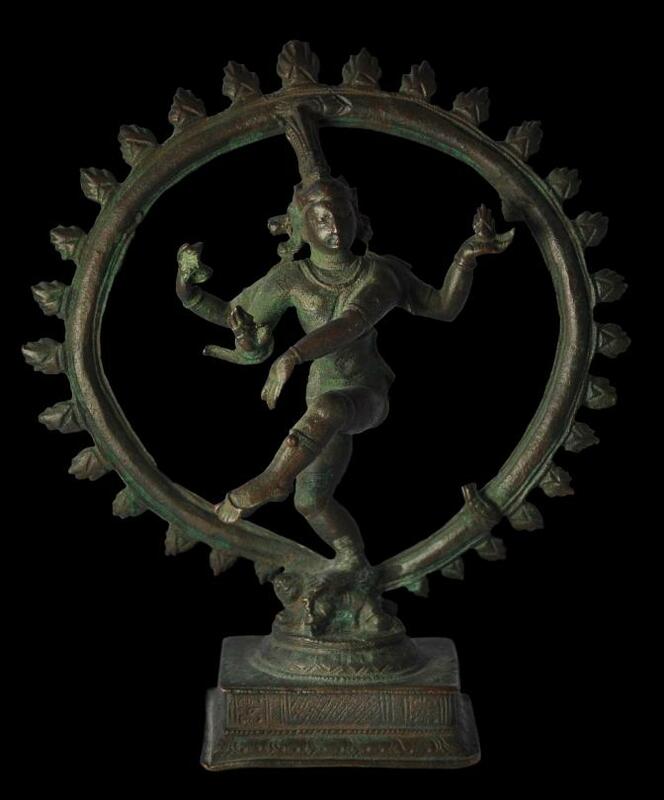 Shiva’s dance on dwarf Apasmara symbolises Shiva’s victory over ignorance. 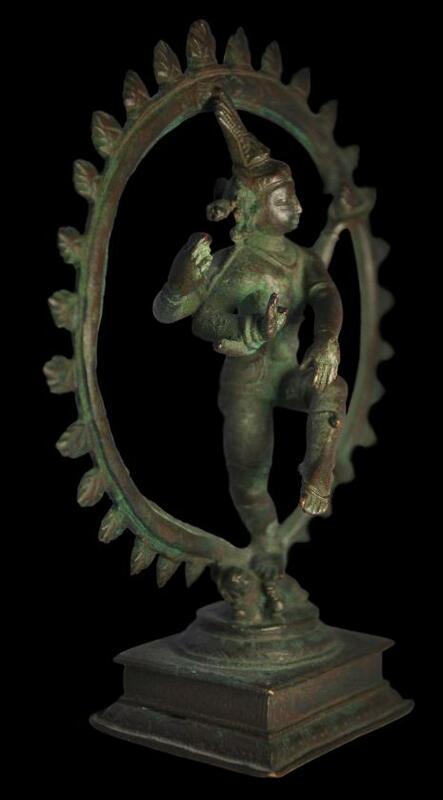 Overall, the image here is a fine example of a miniature Nataraja bronze. 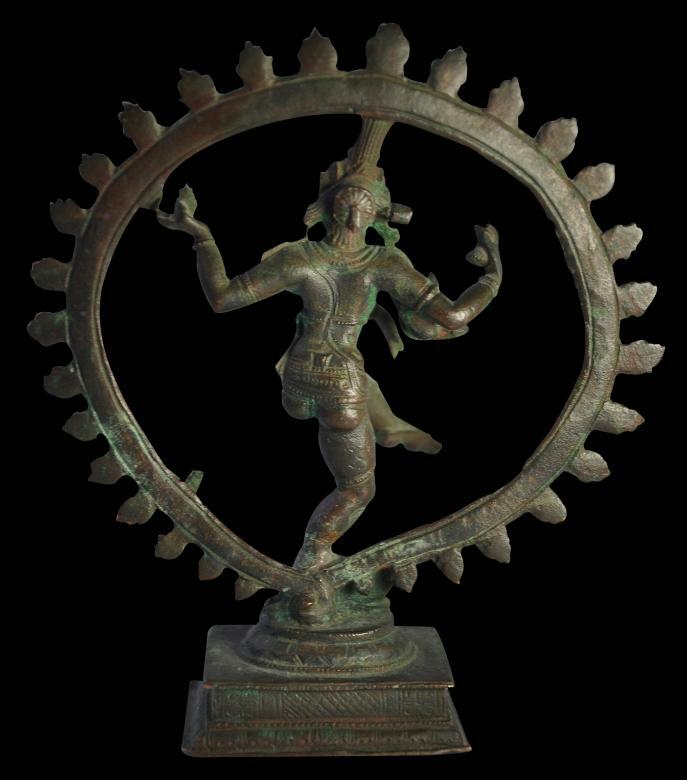 Dehejia, V., The Sensuous and the Sacred: Chola Bronzes from South India, American Federation of Arts/Mapin, 2003.
et al., Chola: Sacred Bronzes of Southern India, Royal Academy of Arts, 2007. Indian Art in the Ashmolean Museum, Ashmolean Museum, 1987.